﻿ InstEd It! - InstEd Plus - New Release! InstEd Plus - New Release! InstEd Plus provides the fastest, most flexible way to do exactly what you need to do. The philosophy behind InstEd Plus is to allow you to achieve complicated tasks as fast as possible, while providing excellent control of all the changes that happen. Last released Apr 22, 2010. The System Viewer (1.0.3.4 and later) provides an overview of the file and registry changes on the target machine. It can be filtered by Component, Feature, Feature with Parents. Right clicking on any component field will allow immediate filtering by that component to see a system view for just that component. Clicking on any row in the System Viewer navigates InstEd to that table row in the background for further exploration. A visual indication of the "weight" or relative amount of entries for each folder/registry key is provided. The new field editors (1.0.3.4 and later) provide the most information in the best way as you edit fields. First 3:30 provides an overview of the problem that File Manager solves that other tools don't. Skip to 3:30 to see a demo of the functionality. Drag and drop files from explorer into the installation. InstEd Plus provides a file manager plugin allowing you to add files to the installation using drag drop. In keeping with the "easy but flexible" philosophy, the File Manager provides excellent defaults for component names, short filenames, cabinets, etc, while allowing you to customise where required. You can easily manage cabinets, dragging file entries between cabinets, and trigger rebuilding of the cabs. See the Directory table as you have never seen it before. Complete Source and Target trees, linked for dual navigation, showing contained files. Ever been frustrated by a fancy gui's disjointedness from the tables? Every item in InstEd Plus will navigate InstEd to the relevant row. Click a file in InstEd plus, and the File table entry becomes selected. Click a Directory, and the Directory table entry becomes selected. And so on. Combined with InstEd's relationship tracking, navigating the tables has never been easier. The File Manager window is not a child of the main InstEd window. This allows you to do normal work in InstEd, while leaving the File Manager window open. The File Manager window will reflect all changes to the tables immediately. Similarly all changes made using the File Manager window will be reflected in the main InstEd window immediately. In a multi-screen environment, this is a boon, allowing intuitive navigation of the installation using File Manager on one screen, with quick switching to the tables to see all the data that you need. Of course, multi-screens is not required, as ALT+TAB, or stacked windows, provides the same functionality, just without the screen real estate to see everything. Extract the msi files into the source tree. 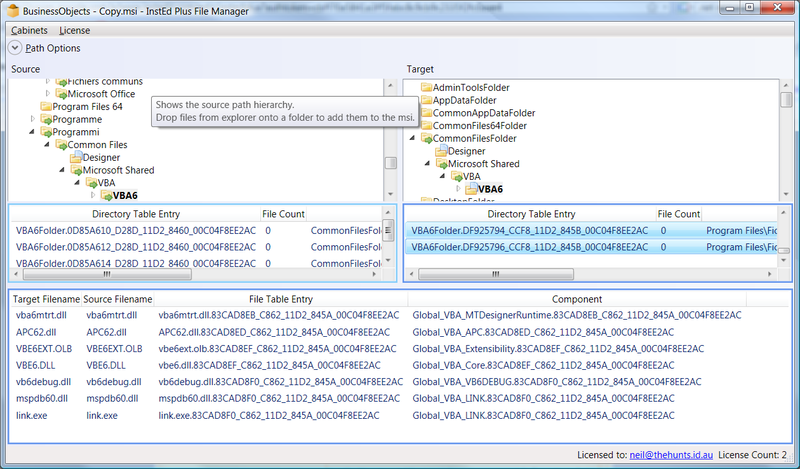 Easily extract the msi files into a new source folder, even from merge modules. This allows you to make the changes you need and the rebuild the cabs and/or update the file details. Change between long and short filenames as you build the source tree. Build the cabs from an arbitrary source tree root folder, instead of just the msi's folder. This allows you to try things out, or maintain different source trees for different SKU's. When dragging files into the installation, File Manager now understands when the target is a merge module, appends the appropriate extension to identifiers, and manages the #MergeModule.CABinet. Feature editing - Drag and drop components, features, and component elements around. Dialog editing - WYSIWYG dialog editing. Sequence editing - Visually see what's happening in the installation sequences.